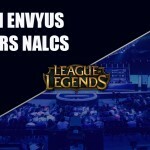 Welcome to Day Three of the North American Promotion Tournament for the League of Legends Championship Series. 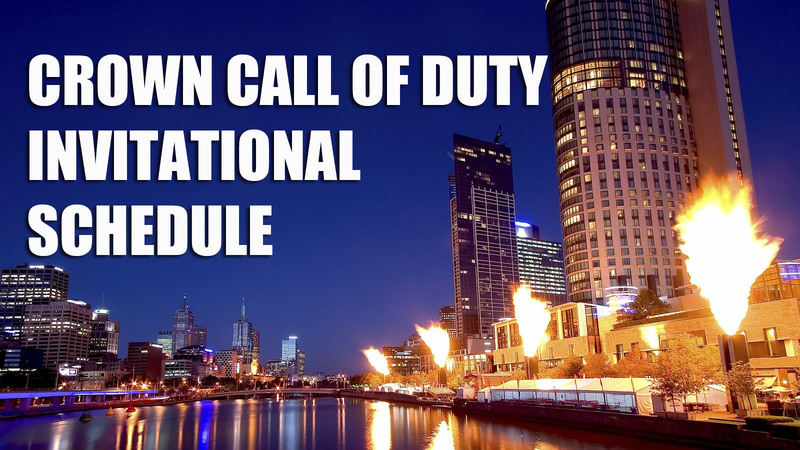 As usual, I’ll be bringing you play-by-play of the tournament’s matches. The live blog should auto refresh right before your eyes, but feel free to refresh the page yourself for the latest updates. 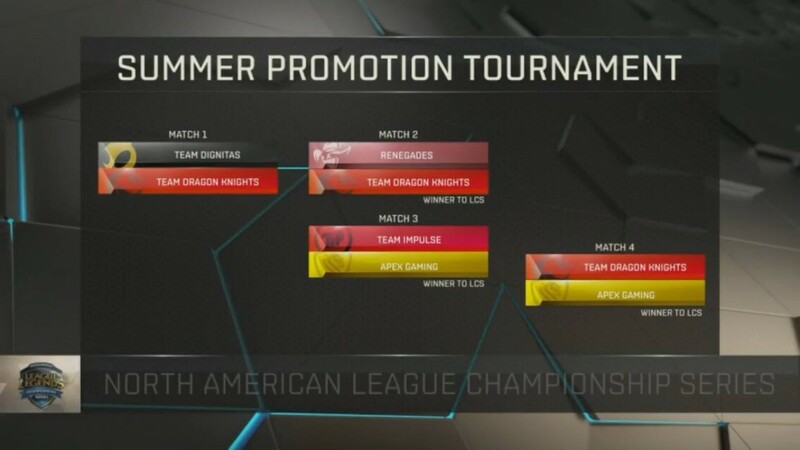 Apex and Team Dragon Knights will battle it out to see who takes the last remaining spot in the LCS Summer Split. 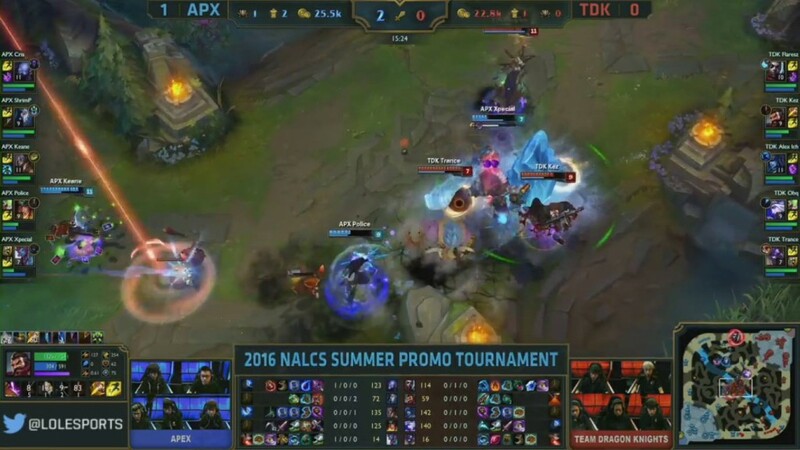 TDK are coming off a 3-0 whitewash by a resurgent Renegades and Apex lost 3-1 to Team Impulse yesterday. 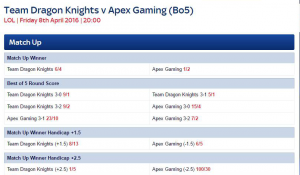 Apex, who are the #1 Challenger seed team coming into this promotion tournament, are pre-match favourites at 1/2 – TDK are valued at 6/4. Odds as advertised by SkyBet. 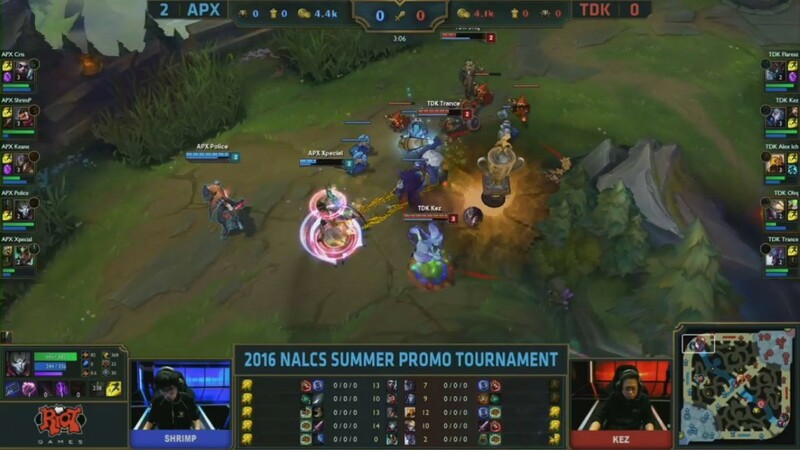 Hello, and welcome to the TDK vs Apex live text commentary! 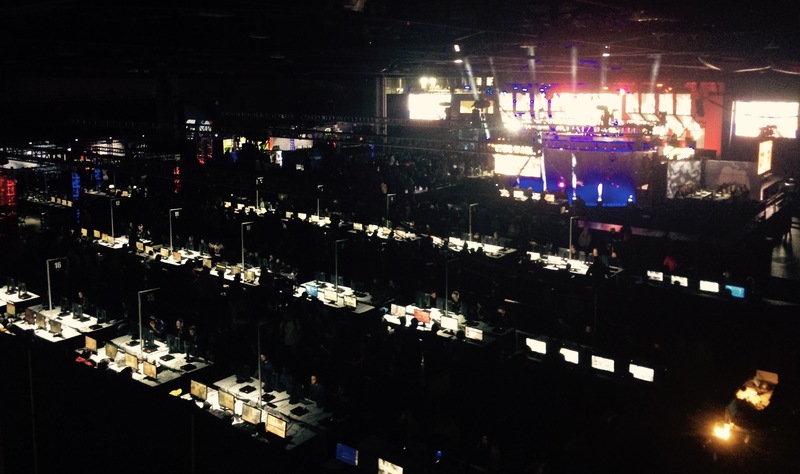 In less than 20 minutes time we’ll see the start of Day 3. 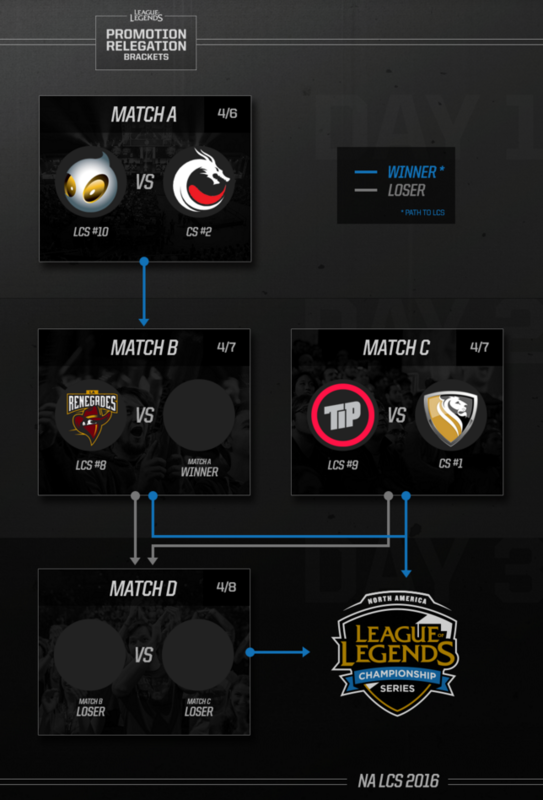 Which one of these teams will win and cement their place in the LCS Summer split? 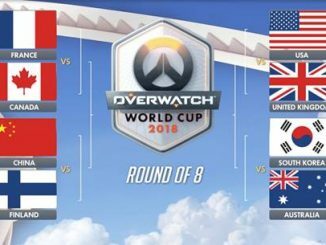 Tweet me @eSportsMichy with your predictions. A look at how the tournament has progressed so far. Here we go then, picks and bans underway. 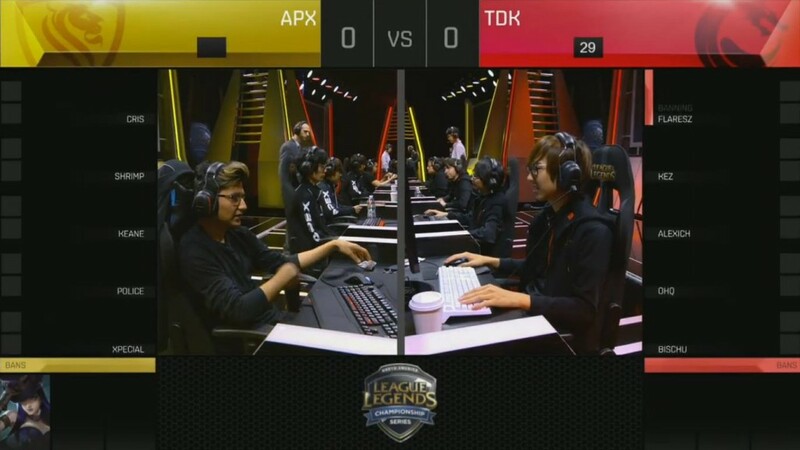 The last time these two faced each other, a couple of weeks ago at the Challenger Spring Split finals, Apex came out 3-1 winners. Mental advantage? Here we go then, game one has started! 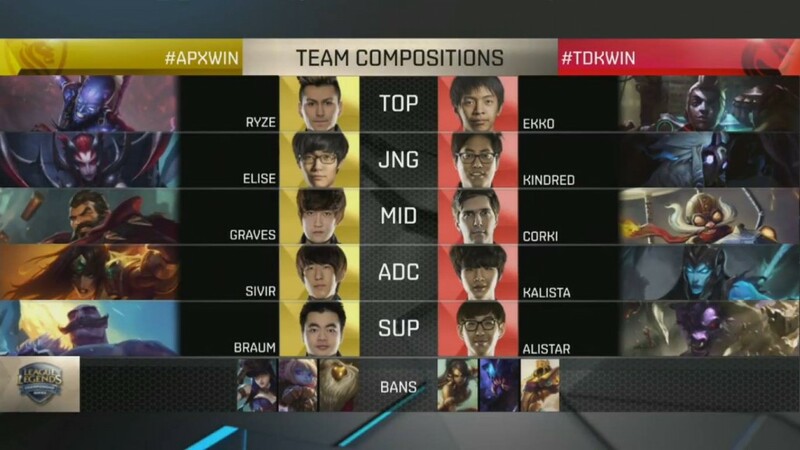 Game one is yet to get underway due to Cris accidentaly picking the wrong masteries. 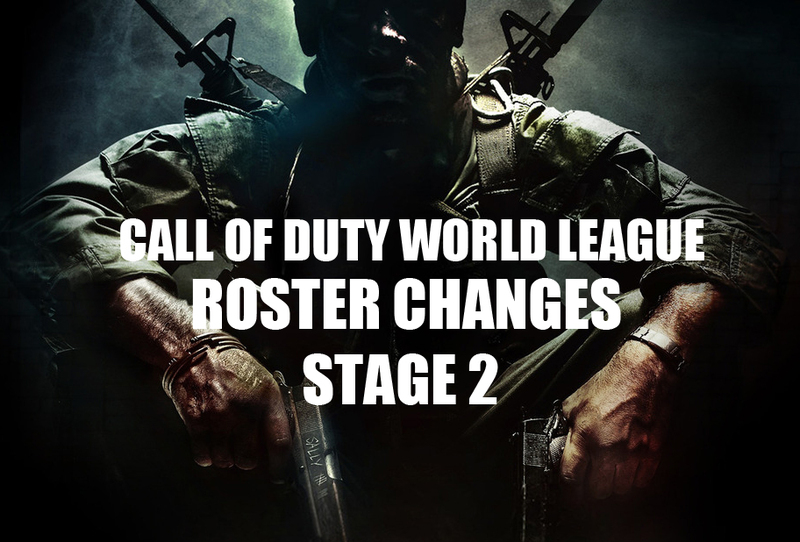 He isn’t allowed to change them though, and the game gets back underway. 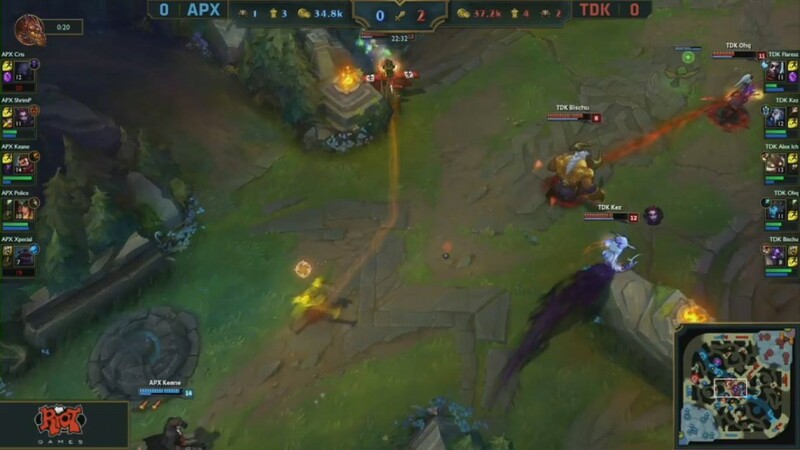 A good early game start by TDK sees them match Apex’s tower kills whilst also being able to secure both Rift herald and Dragon. Early gold gained. Here’s your 10 minute update. 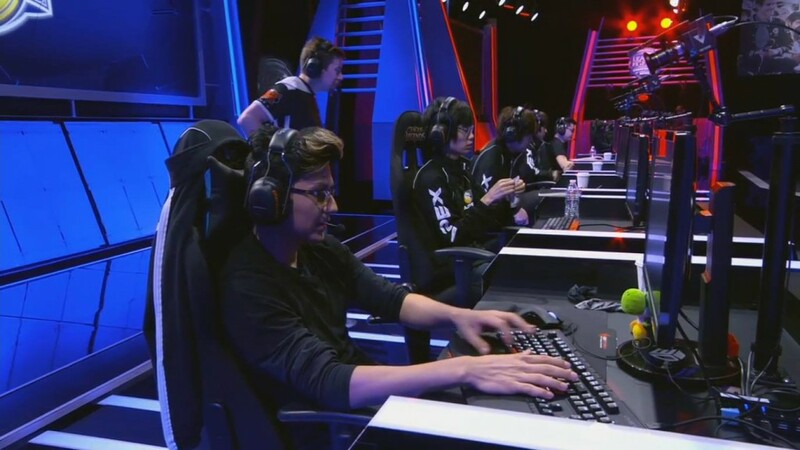 Both teams posture around dragon. 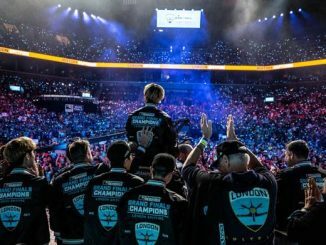 Apex secure both rift herald and dragon. 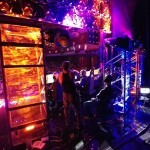 Both teams push 2nd tier towers. 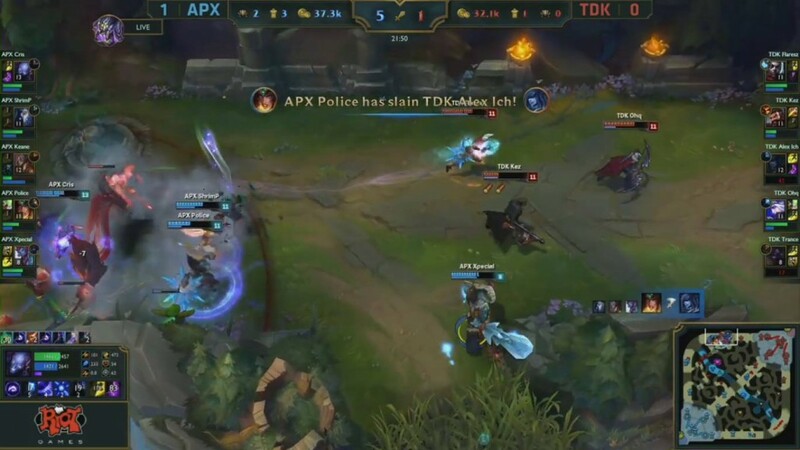 Apex keep on pushing though and the rift herald buff helps them take down TDK’s inhib tower down to half health at just 12 minutes! 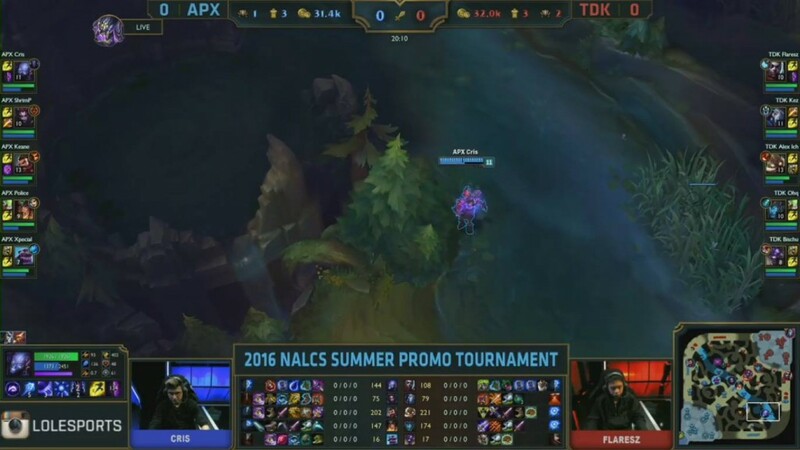 14mins in and TDK still have a gold lead, mainly down to OHQ’s Kalista out-farming Police by nearly 40 CS. 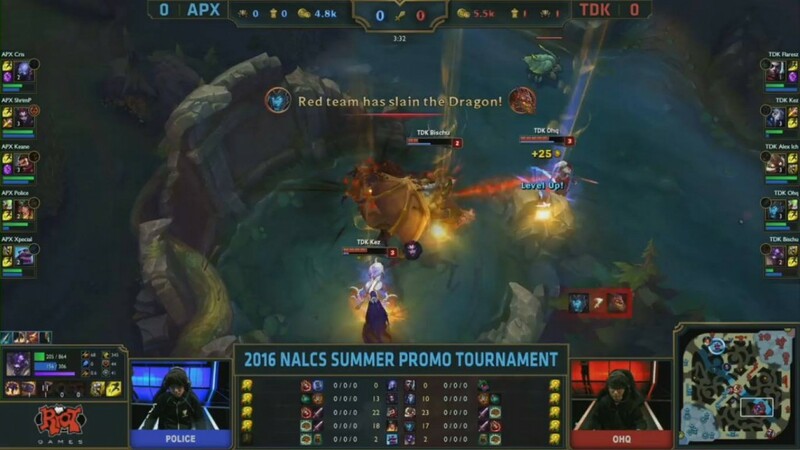 TDK secure their 2nd dragon. Here’s your 20 minute update – still not kills just yet…I promise it’ll pick up very soon. See! Would i ever lie to you? 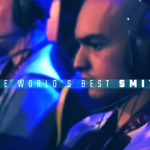 Cris catches OHQ in Apex’s red side jungle – but he doesn’t have enough damage to delete him. The rest of TDK turns on Cris and deletes him for first blood. TDK pick up another before retreating to prepare for the Dragon that’s up in 20 seconds. This game is hitting its stride now! 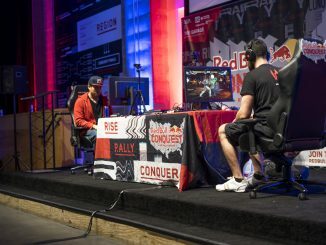 The two teams eye each up around dragon and TDK makes the first move. 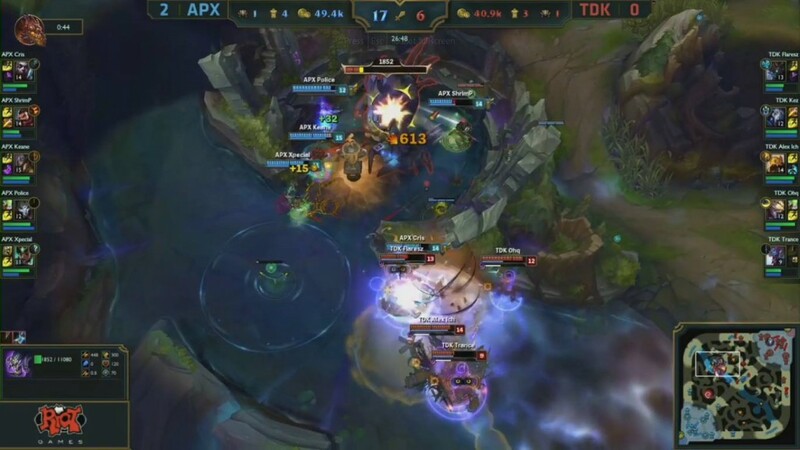 Flaresz teleports behind Apex and TDK reacts quick to pick up a kill – they get low though, and Keane is able to ult Bischu to balance out the kills in this fight. 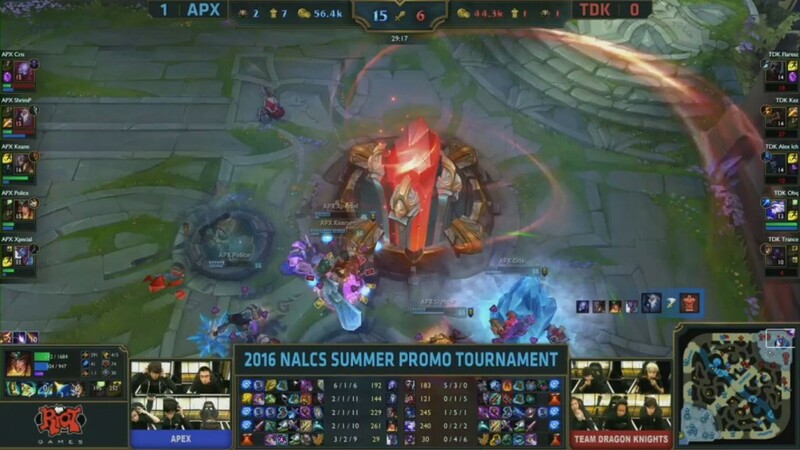 A huge fight in top lane sees Apex pick up 3 kills, only losing their Ryze! 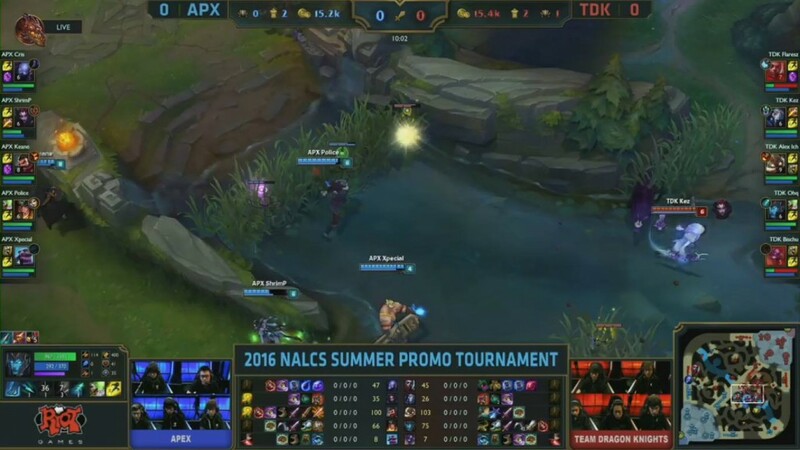 Kez and Ohq get really low too and are unable to stop Apex securing Baron. Huge. Keane is huge right now on Graves. 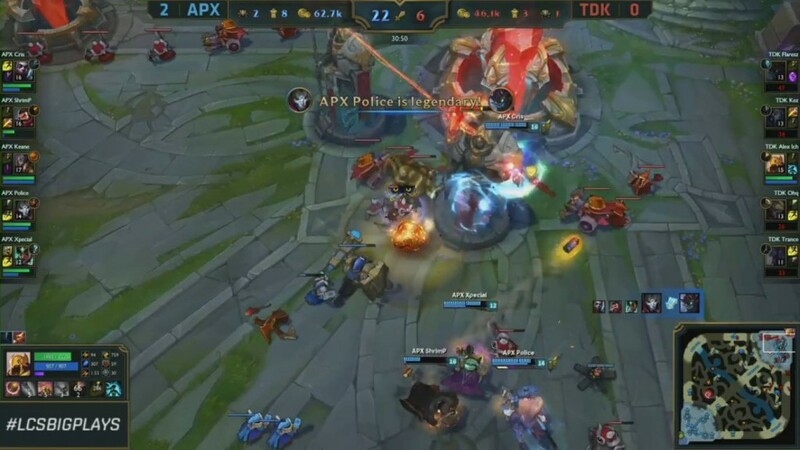 TDK looked to have succesful defended their 2nd bottom tier turret after Kalista ults Braum into the Apex team – but Keane does tons of damage and is deceptively tanky too! Apex turn the fight around, take the tower, and will regroup for another push. Wait a minute, are TDK back in this? 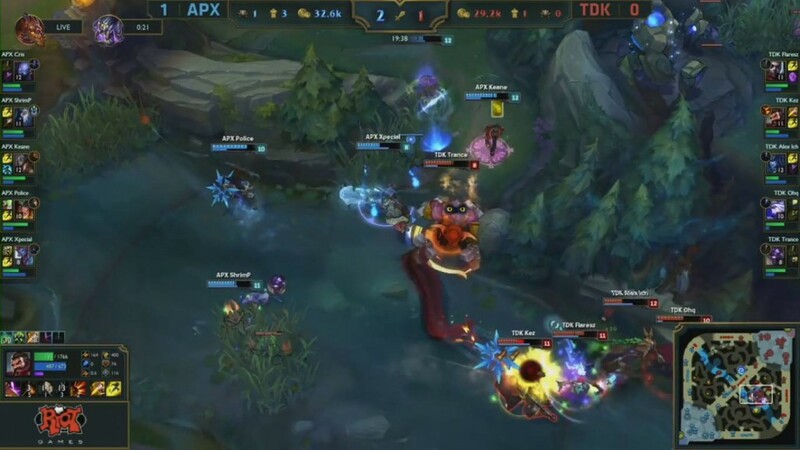 TDK catch out Shrimp wandering about in their red side jungle, and then push on to pick up another 2 kills! 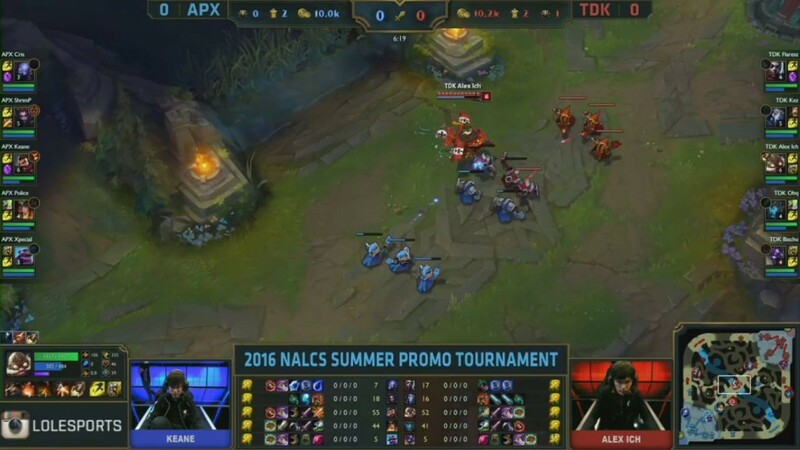 Keane does take their top inhib turret in the process though. Baron coming up in 1minute time! Fight! 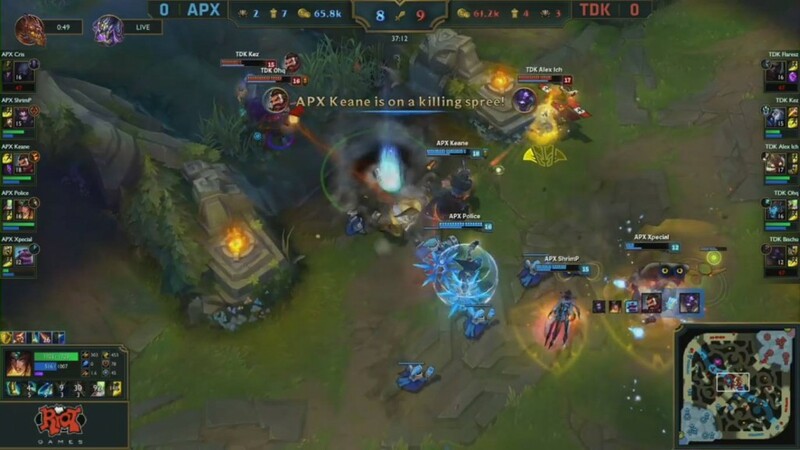 Apex pick up 2 kills in the mid lane – Keanes Graves yet again proving to be too much to deal with – they need to shut him down to stand a chance! Apex grab dragon. 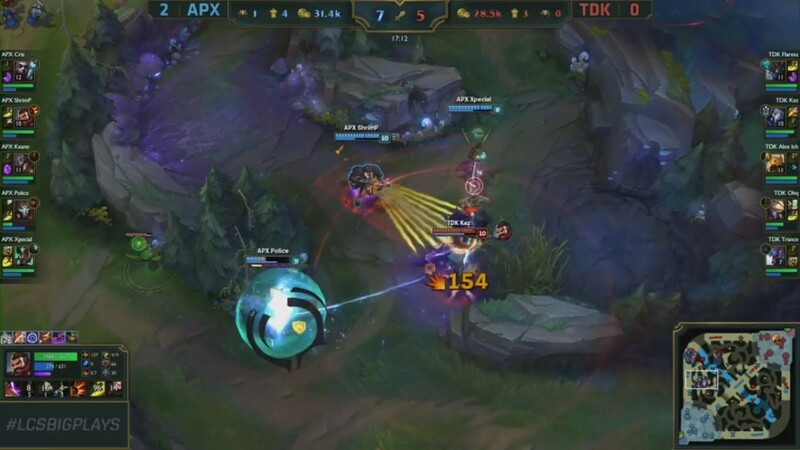 Both teams dance around the baron pit – but look at the bottom left hand corner, minions are taking TDK’s inhib! 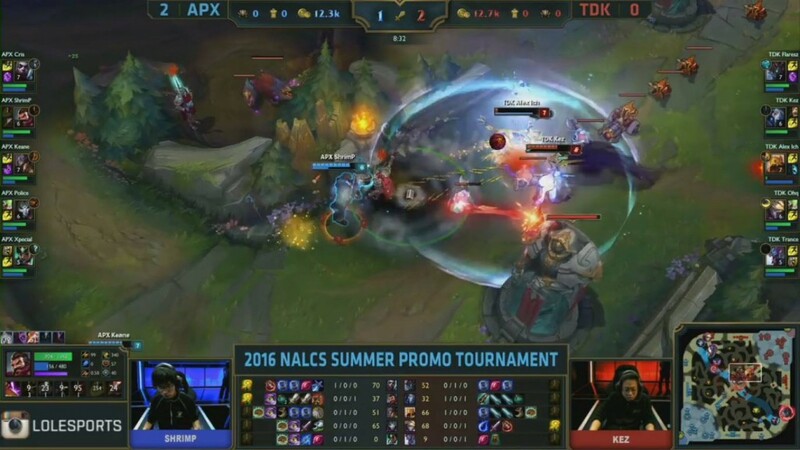 TDK get too low from taking baron and recall to just about save their inhib. 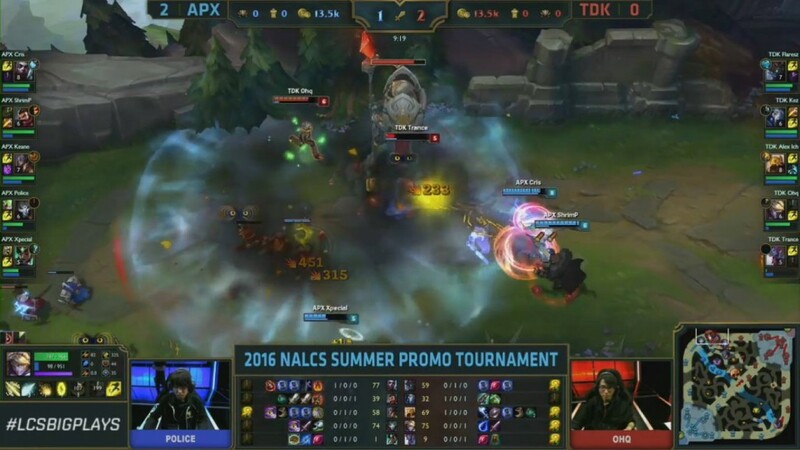 Apex’s Police grabs 2 huge kills on TDK – they go back, kill baron, and Keane kills OHQ! 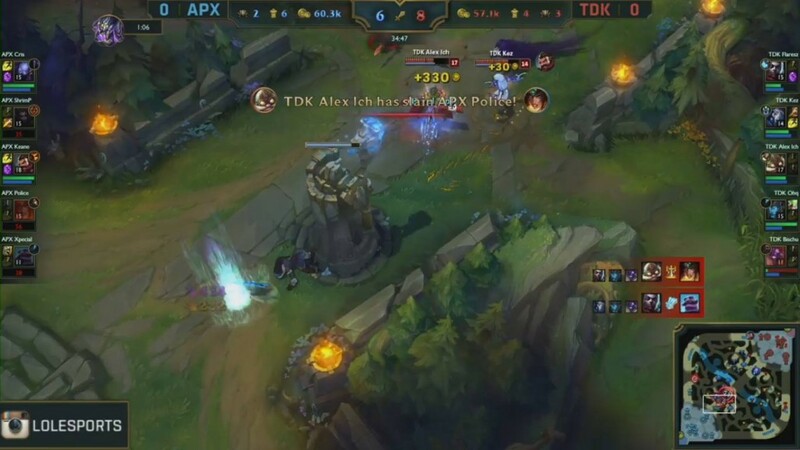 Apex push up mid and destroy TDK’s inhib. Is this game over? 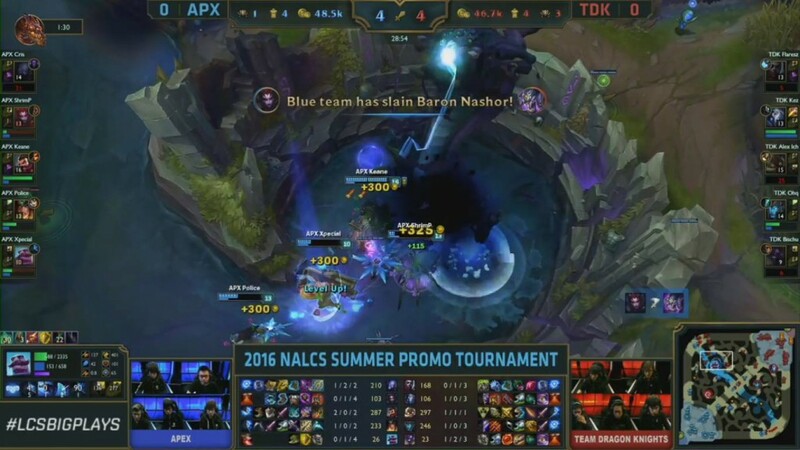 Apex use baron buff to push in and take game one. What a game that was after a slow slow start! 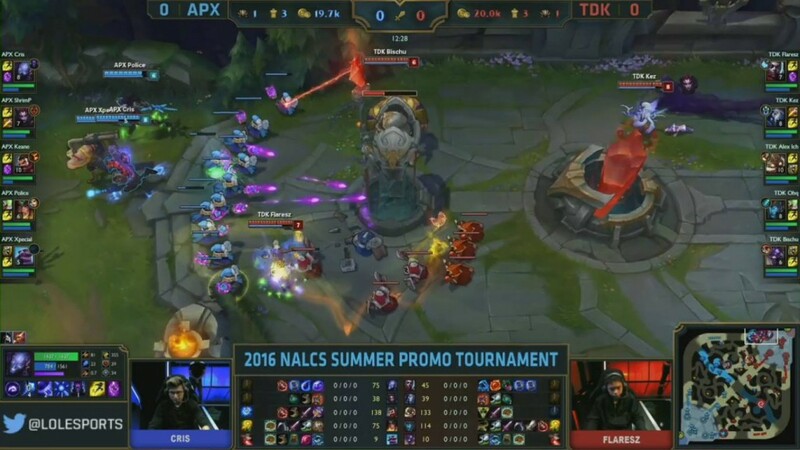 The Graves and Sivir were huge for Apex – here’s a look at everyones stats during that game. Trance subbed in for Bischu at Support. 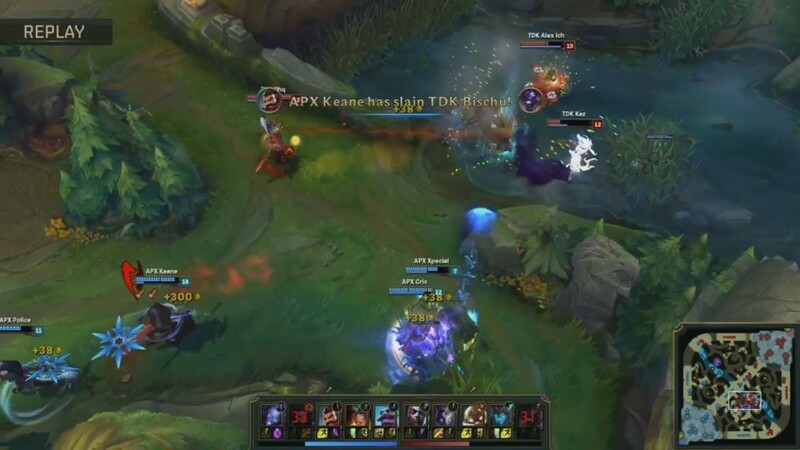 TDK steal away the Graves that Keane used to great effect last game. Will this see them win Game 2? First blood goes over to Cris and Apex. Flaresz a little too over-aggressive. TDK waste an age down bot, comical stuff! They fail to get anything from it as Xpecial snuffs them out. A chaotic fight in mid sees Xpecial finish off Alex ich. 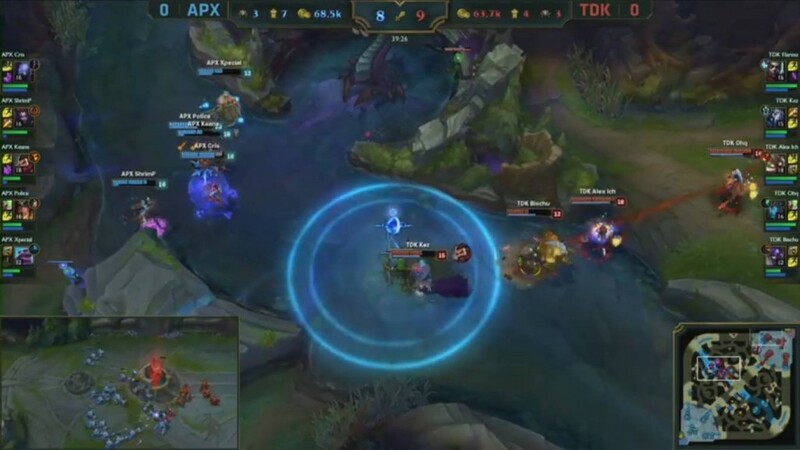 Apex push to take mid turret and dragon. Ohq misses an Ashe arrow down mid on Keane. 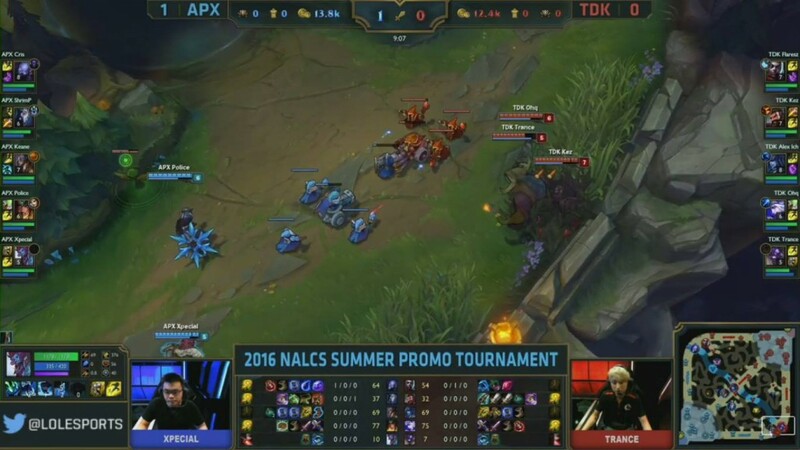 Xpecial sees this as a chance to engage on 3 members of TDK in the mid lane – a massive misjudgement. TDK explode him and the teams back off. 1-0 for TDK that fight. 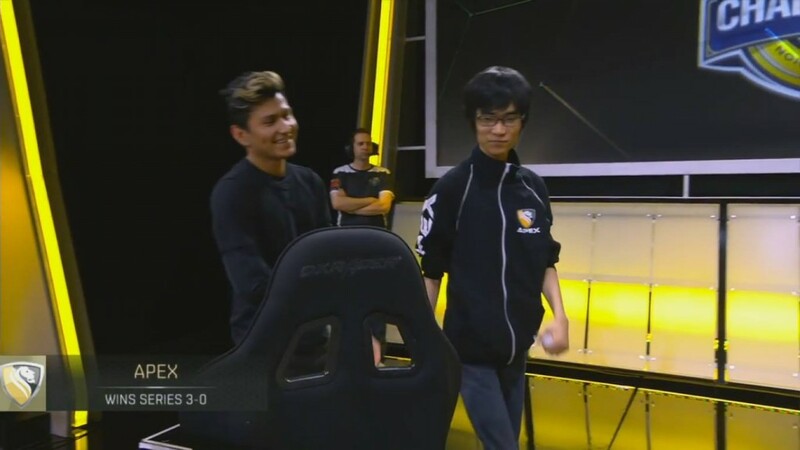 A huge pillar by Xpecial stops Alex ich in his tracks! 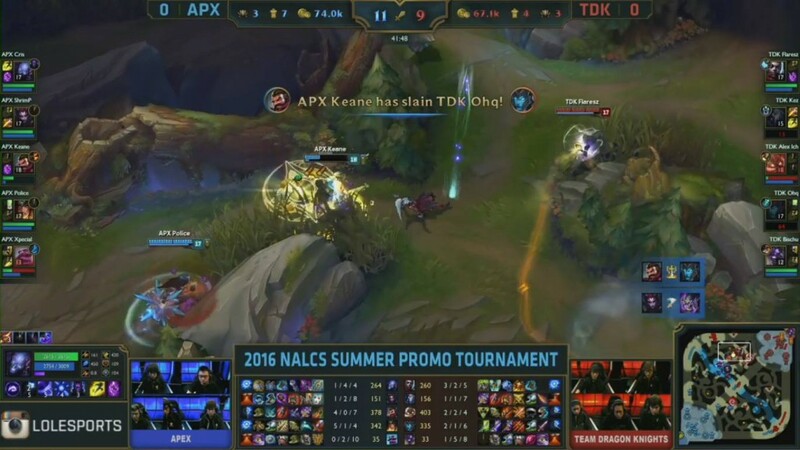 A team fight ensues and TDK start to retreat – trance gets caught and goes down. Apex then take dragon. Apex in control here. 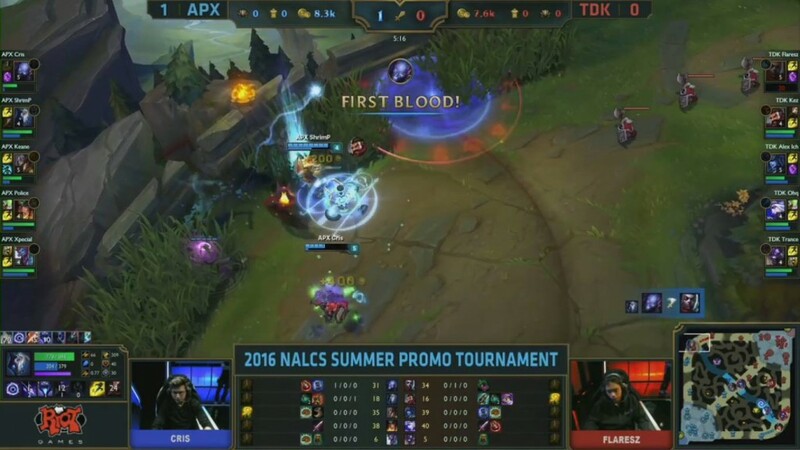 We saw this yesterday when Apex faced TiP – the Twisted fate is causing all sorts of problems for the opposition. 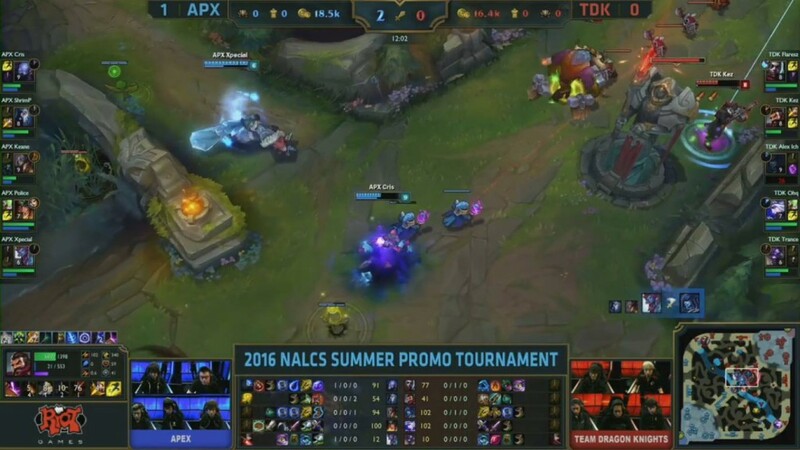 Keane ults into top lane and Apex are able to pick up a kill onto Trance and Alex ich. An ace for TDK! That fight was everywhere! Alex ich catches off Shrimp off to the side – he goes down – but then Cris catches OHQ round the back of the team. Flaresz was doing work throughout the fight, taking down Police. Game on. 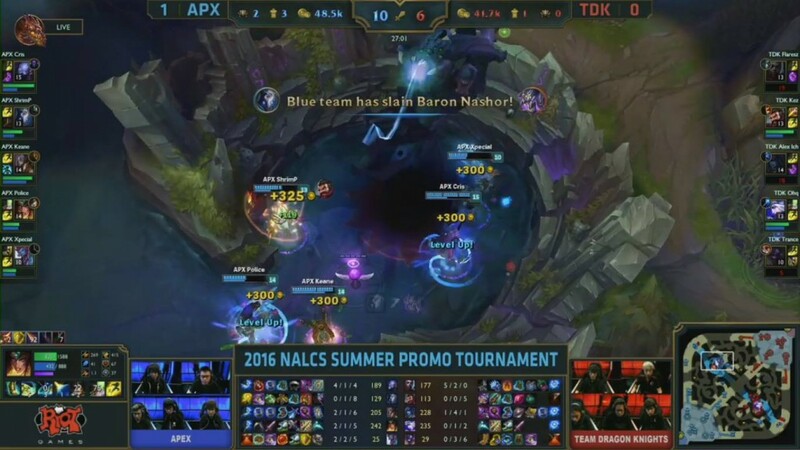 Baron for Apex! 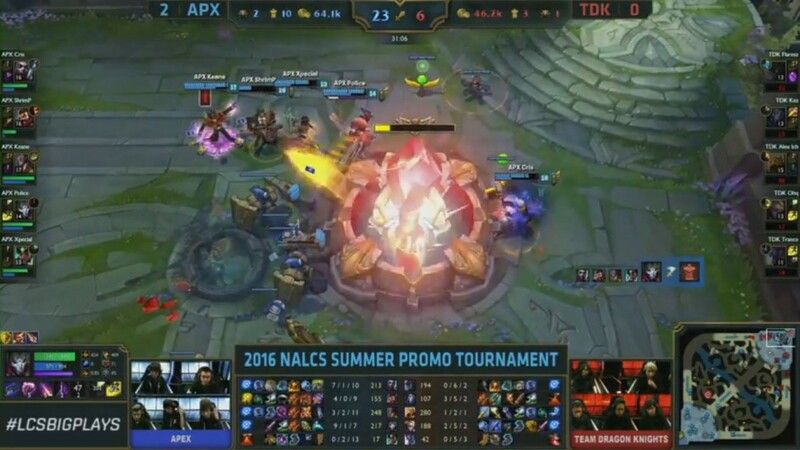 A fight down near Dragon sees Apex secure 3 kills onto TDK. They secure Baron, the 3rd of the day. TDK throw away that comeback. 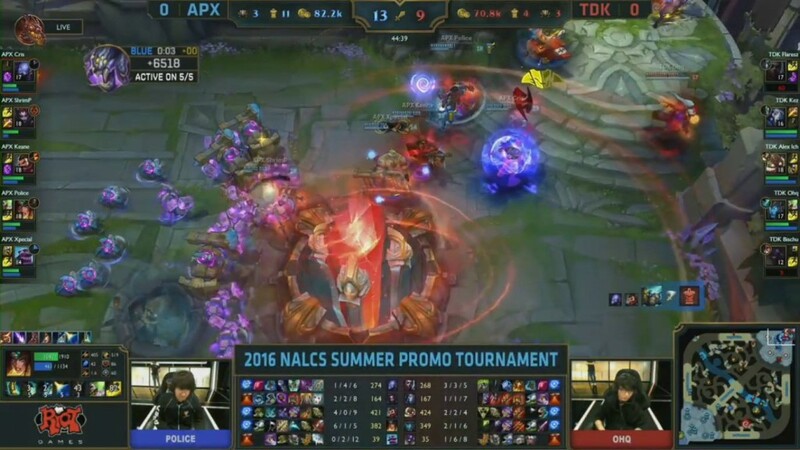 Apex and TDK fight again! Apex win the fight comfortably and push on to win. 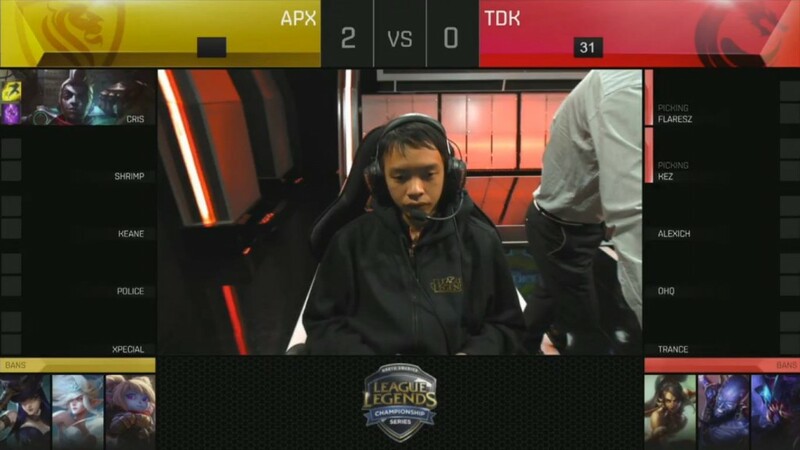 TDK now need to reverse sweep Apex to make it into the LCS Summer split. We’re back underway in Game 3! Apex looking for a win to cement their place in the LCS Summer split. Here we go, game 3 is underway! A quick early gank by Kez catches Apex off-guard. 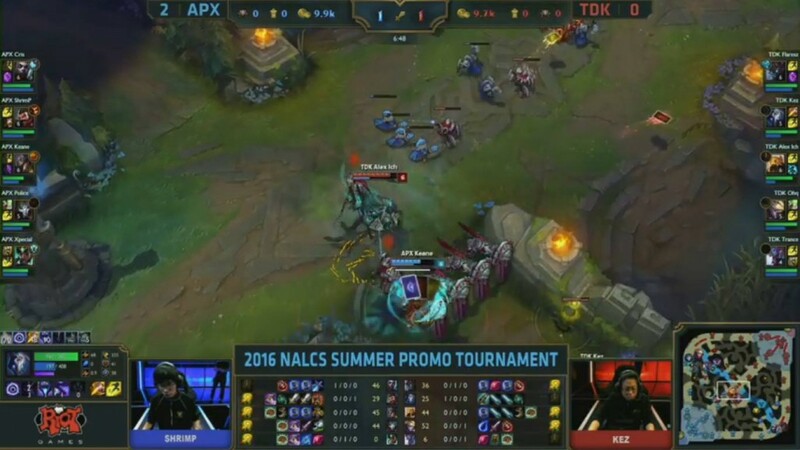 Kez secures the kill onto Xpecial. Good start for TDK. 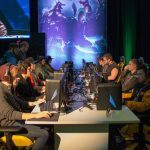 Shrimp continues to play well for Apex. 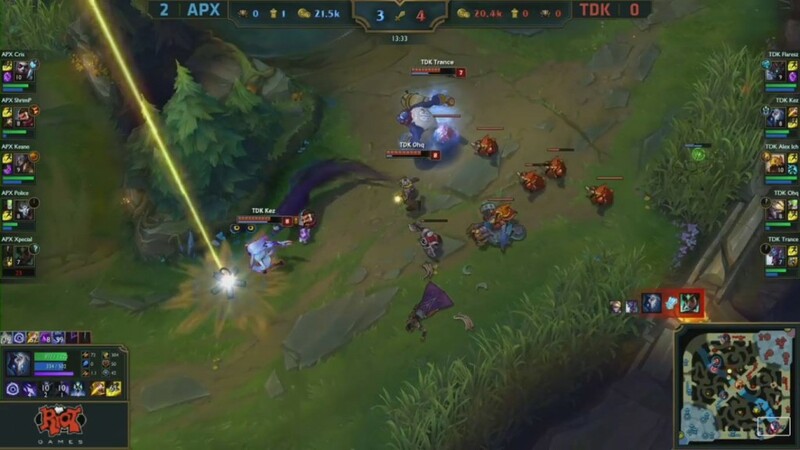 Him and Cris tower dive Flaresz’s Maokai under the turret. Ekko, who was already far ahead, now gets a kill to his name. Flaresz also misses out on tons of CS. The Azir slide by Alex ich is beautiful. 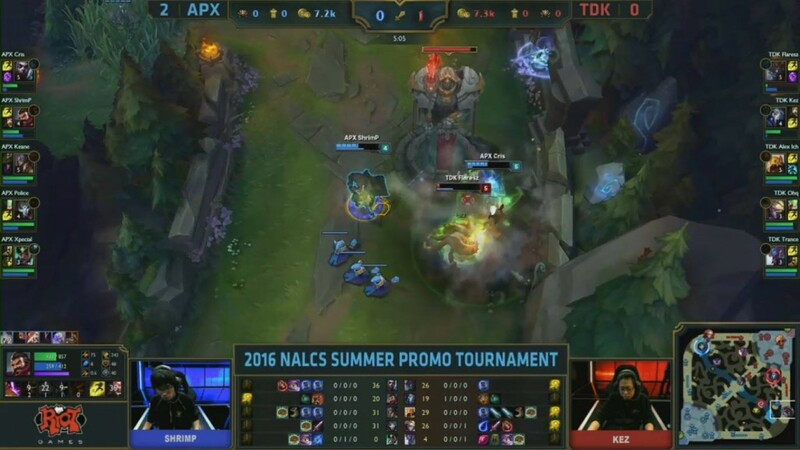 He Azir shuffles over, ults Keane into Kez, and they are able to grab the kill. An eventful start for both sides. 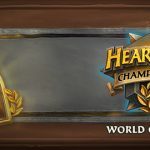 Shrimp thinks he’s killed Alex ich after a gold card stun by Keane…but no! Kez ults and saves his team mate. Beautiful play. A tower dive top sees both OHQ and Trance going down. 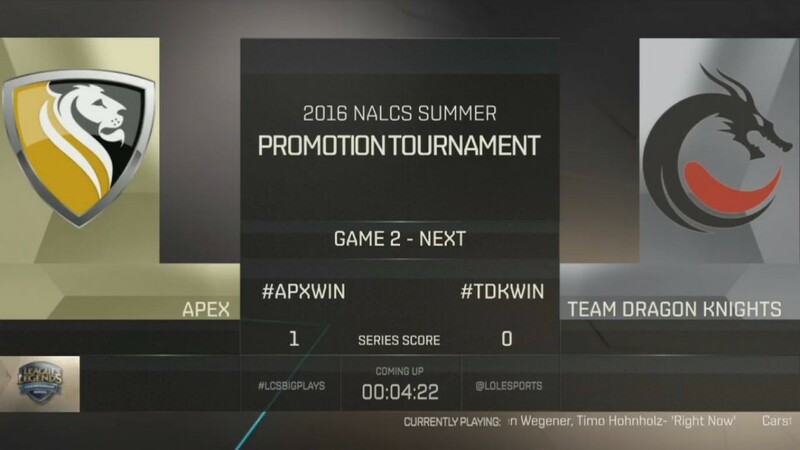 Apex now take the gold lead. 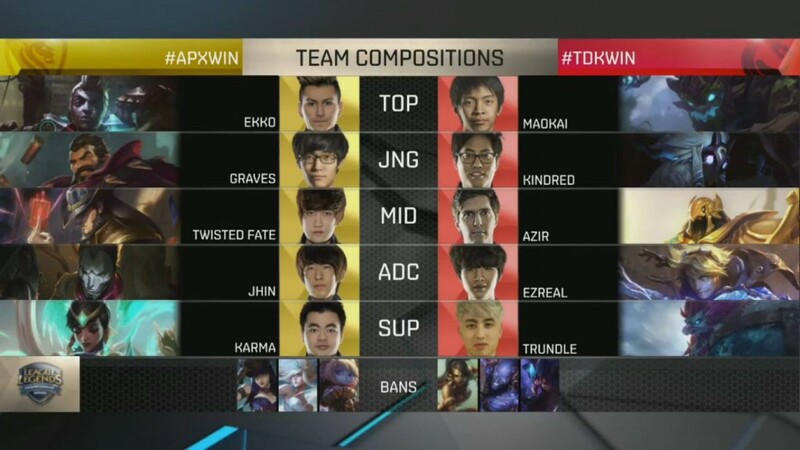 Kez catches out Xpecial and is now 3/0 on Kindred. 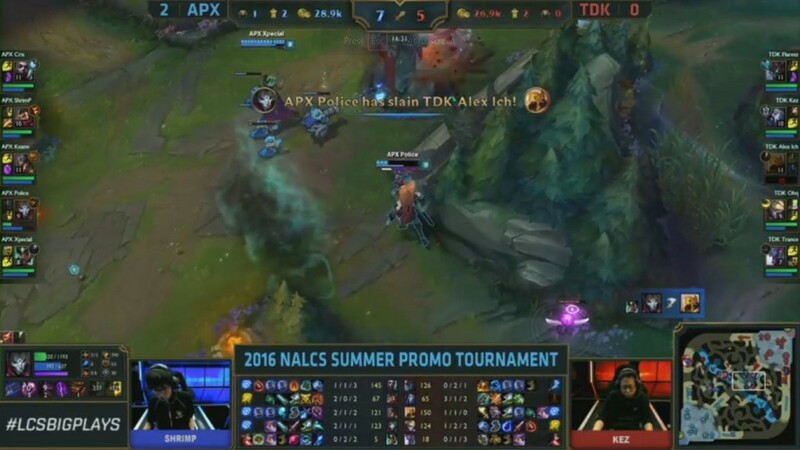 TDK are caught overextending top lane. 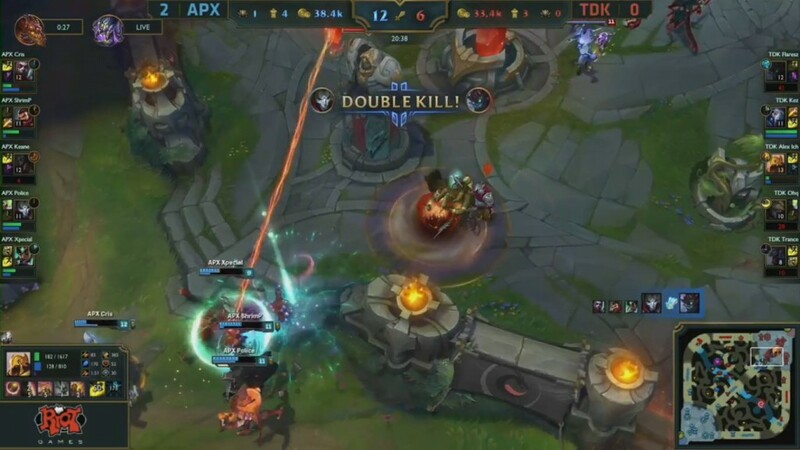 Apex, on their way back from taking 2 towers mid, collapse in on the top lane and find Kez and Ohq. Getting out of hand now. 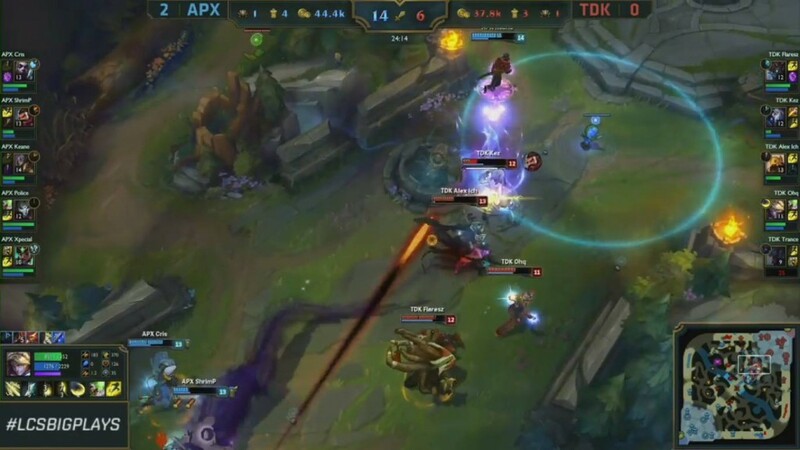 Apex take Rift herald but are extremely low whilst doing so. Keane gets picked off, but Cris teleports to a ward, with homeguards, and is able to get a double kill! 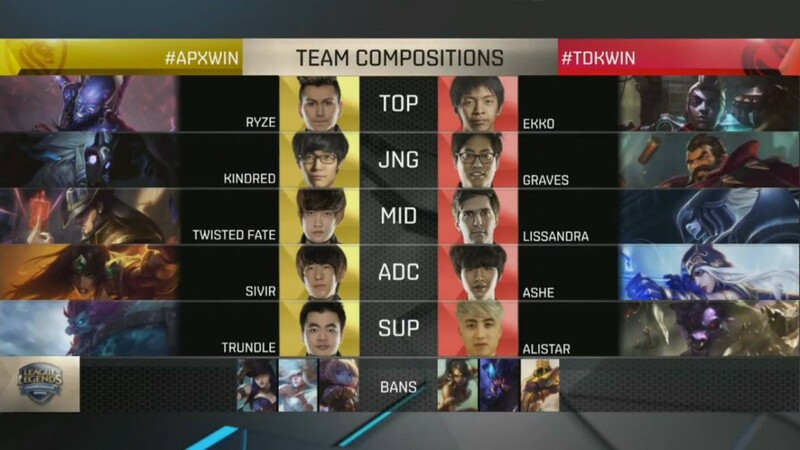 Apex will recall then focus on this mid inhib. 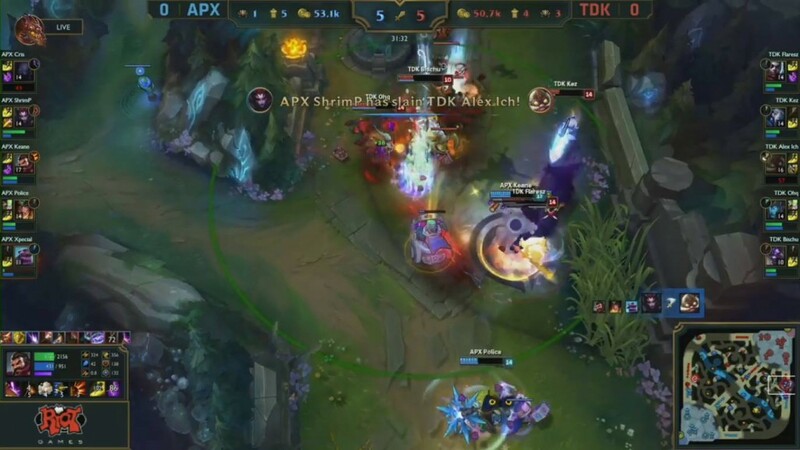 A fight occurs as TDK try and push Apex’s mid tower. A flash gold card from Keane onto Kez causes TDK to retreat. Trance gets picked off first, then a teleport by Keane catches 4 members of TDK. Only a matter of time before this is over. Oh. My. Word. Cris. Cris has had a godlike game on Ekko. A 4 man stun allows his team mates to pick up Baron with ease. He then picks off Flaresz. Cris teleports behind TDK, who were trying to catch Keane. 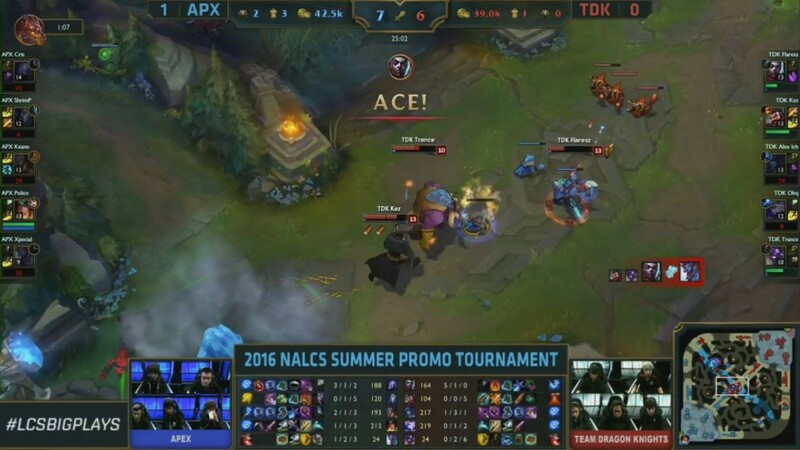 It results in an ace and Apex are your winners! 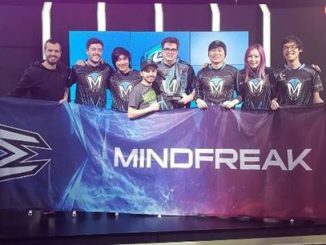 3-0 series win sees them qualify for the NA LCS Summer split. Shrimp and Cris were huge in that game – it’ll be hard to pick an MVP for this series – both played brilliantly. 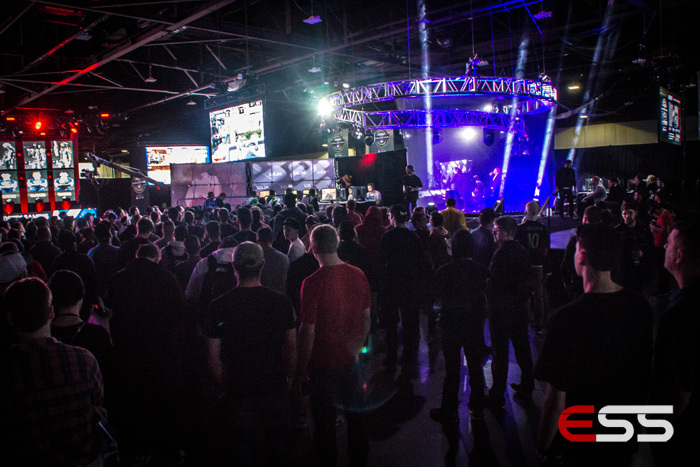 And that’s it from me and the NA Promotion Tournament. 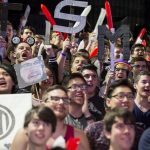 Renegades, TiP and Apex will all be in the NA LCS Summer Split. 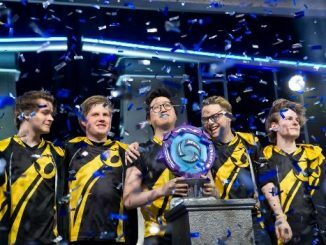 It’s heartache for TDK and Dignitas though, who will have to compete in the NA Challenger Series. 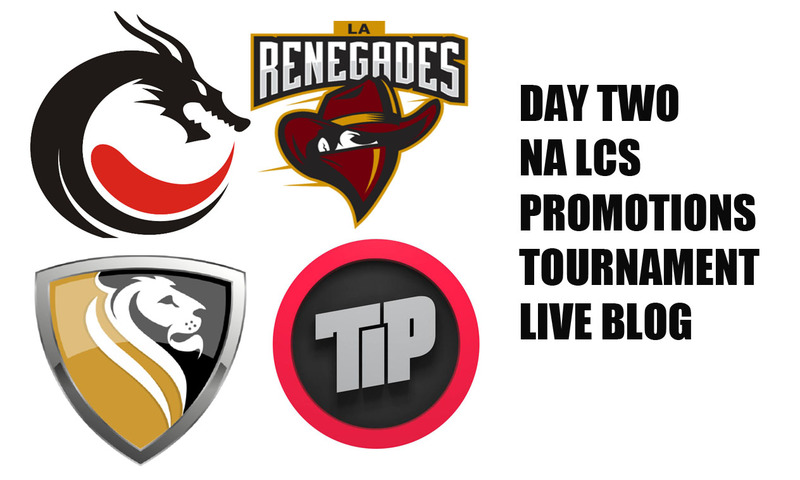 Join me again tomorrow, where the LCS Semi-Finals will take place! I’ll see you then.